Environmental authorities will allow water to rehabilitate itself naturally while capping emissions to purify the country's waste-choked rivers and lakes, Zhou Shengxian, the top environmental official tells China Daily. Q: The 17th National Congress of the Communist Party of China (CPC) placed unprecedented importance on protecting the environment. As the minister of the State Environmental Protection Administration (SEPA), how do you see your obligations in the future? A: President Hu Jintao, in his political report to the conference, said China's economic growth comes at an excessively high cost to our resources and the environment before he listed other difficulties and problems hindering development. He said the public will be made more aware of conservation and that China must give prominence to building a resource-conserving and environment-friendly society in its strategy for industrialization and modernization. The country must also get every organization and family to act accordingly. 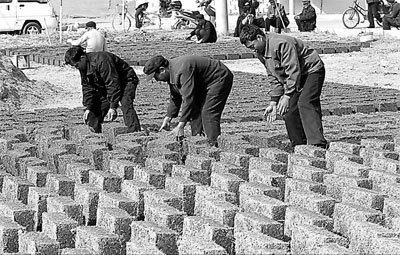 Farmers in Linyi, Shandong Province, make bricks from a mixture of straw and earth that will be used to build energy-efficient houses. Hu's report indicated that, as a basic national policy, environmental protection has truly begun to play a key role in the country's economic and social development. The green drive has coincided with an unprecedented opportunity for development. The SEPA will abide by the country's policy of the scientific outlook on development, focusing on the control and treatment of water, air and soil pollution and giving top priority to ensuring the safety of driving water. Q: Since the Sixth National Conference of Environmental Protection in April last year, the SEPA has listed drinking water quality as its top concern. What difficulties or problems do environmental protection authorities face in combating water pollution? A: In recent years, various departments and local governments have strived to control water pollution by phasing out energy-consuming, heavy-polluting small plants. Urban areas have sped up the construction of sewage treatment plants. And systems for protecting drinking water source areas have been strengthened. Thanks to their efforts, China can basically ensure the quality of its drinking water and stabilize its water quality in general, even as it has carried out fast industrialization and urbanization. However, it needs to be on high alert because industries that use a lot of energy and water and release a lot of pollution are still expanding fast. Water pollution has not decreased much. China's water quality is facing a tough challenge. Water pollution has affected people's health and social stability and become a bottleneck thwarting China's sound and rapid economic and social development. Official figures from last year showed that surface water in China was generally moderately polluted. One third of the 744 samples of surface water taken were graded "V", or the worst polluted. More than 40 percent of the samples taken from major rivers fell short of water quality standards. And those sections of rivers that passed through urban areas were almost all polluted. In addition, China has more than 20,000 chemical factories, of which almost half are located along the Yangtze River. There are 3,800 along the Yellow River. Accidents leave large sections of the rivers polluted. Q: The SEPA has proposed "letting rivers and lakes rest in peace and rehabilitate themselves" at many key water pollution control conferences. What should the public make of this? A: Letting rivers and lakes rest in peace and rehabilitate themselves means showing the water cycle affection, allowing it to recover naturally. In practice, this requires encouraging widespread water conservation, setting economic development goals in accordance with our resource capacity and strictly controlling pollution. Administrative orders, as well as legal and market-based tools, should be brought to bear, based on scientific assessments of the ecosystem. Q: What are China's targets and guidelines for treating water pollution? A: From a long-term perspective, our target for China's rivers is for them to resume their natural appearance. The ecological system should maintain a virtuous circle and all rivers should flow calmly along their natural course. In the short term, the quality of China's key drinking water resources should meet national standards by next year. By 2010, 70 percent of urban sewage will be processed before being discharged and the chemical oxygen demand will drop by 10 percent from the 2005 level. Give priority to protecting the environment. Ensure the quality of drinking water. Clarify the responsibilities of environmental agencies. Strengthen water management and coordination. Q: What key measures will the SEPA take to reduce water pollution and prevent the quality of the country's water from deteriorating further? To control water pollution, we should first continue to strictly limit the discharge of various pollutants. Caps will be placed on pollutant emissions for different regions in China. All new and existing projects should not produce more pollutants than the set amount. Regions that fail to keep emissions within the limit will not be allowed to start new projects unless they are environmentally friendly. Starting in 2010, tougher emission standards will be adopted for key drinking water resources and during the dry seasons. Environmental agencies will improve their monitoring of heavy-polluting industries and step up efforts to reduce industrial waste. Starting in 2009, all companies that discharge pollutants must obtain environmental permits, or licenses. Otherwise, they will not be allowed to operate. Firms found guilty of violating environmental regulations or that fail to meet discharge regulations will not be allowed to list on the stock market. Listed companies should open their environmental records to public scrutiny. The country will speed up efforts to phase out outdated techniques, equipment and products by the end of 2010. China will step up measures to control pollution caused by farming. Sewage systems in rural areas must be improved. The use of chemical fertilizers and pesticides should be gradually reduced. Also, newly built or renovated poultry farms are required to pass environmental assessments. Continuing the construction of sewage treatment plants in cities. The government will continue to increase the sewage treatment capacity of cities. All new sewage-processing factories must be equipped to remove nitrogen from their emissions, and existing factories must install such facilities before the end of 2010. The unit charge on wastewater treatment will be adjusted to at least 0.8 yuan. Different financial arrangements are encouraged when it comes to treating wastewater. From January to September, the daily handling capacity for sewage in China's cities increased by 9 million tons. Protecting the sources of drinking water. Ports involved in transporting waste, oil and other toxic and hazardous materials are required to leave source areas for drinking water. Early-warning and emergency-response systems should be set up in source areas and at water plants. Environmental impact assessments should be carried out for big water-related projects. Reservoirs for regulating floods and soil erosion should be established in source areas for rivers. Primary forest should be protected. Meanwhile, forestation should be pushed forward.